Everyone talks about different colors of gold when, in reality, only yellow gold will ever be mined. So how – and why – did we end up with other colors, and what difference does it make to a ring? In terms of the difference, we’re mainly talking about aesthetics. Some people have a preference, and some stones work better with one color than another. But there are one or two other considerations if gold is the chosen metal for any ring. Yellow gold, the “real” version of the precious metal, is rarely used in its purest form. We do talk about 24 karats (24k) gold, but at this purity, the gold is extremely malleable. It can cause problems with wearing and misshaping even with great care. Of course, yellow gold is a beautiful metal for rings and other jewelry. It is highly resistant to corrosion as well as being non-toxic and hypo-allergenic in its pure form. Many ways are always being found to make it more usable for jewelry manufacture. The lower the official rating, the lower the purity. At anything less than 24k, yellow gold is combined with other metals such as nickel, zinc, palladium, copper and more. The numbers are important, as gold is considered to have 24 “parts”. To remove some of the softness of pure gold, it is common for the highest grade of gold used in modern ring manufacture to be 22k. The other 2 parts being copper. 18k is usually the most traditional grade of gold on the market. At 9k, therefore, the metal is only 37.5% gold (100÷24*9=37.5). High-quality gold jewelry wasn’t always also from alloys. It once was common for 24k gold to be the primary type of gold. This all changed when the common masses began ordering wedding bands. In order to avoid high costs, the rings were often quite narrow and thin. If a wedding band from, say, a century ago were to be viewed now, it’s likely that at least one part of the band would be worn very thin, and may even have snapped due to the constant wearing. But, whatever the grade, there’s no denying that yellow gold makes for an exquisite ring, and pairs very well with diamonds a little higher up the color scale, as the combination of the yellow gold, and the slight yellow tint of the diamond give the whole piece a warm feel that is in stark contrast to the coolness that naturally goes with colorless diamonds and white metal. Using yellow gold can also look spectacular when against olive or darker skin tones. White gold is often used as a less expensive substitute for platinum, as it bears very similar color properties. It isn’t, however, without its own inherent issues. Originally, yellow gold was alloyed with nickel in a ratio of 9:1, as the nickel acts as a bleaching agent for the yellow of the gold and also served to make the metal more durable. The downside to this practice is that, even in such a low percentage of the overall weight, nickel can cause skin irritations for around 1 in 8 people. As a result, many countries now have stopped using nickel altogether in their white gold jewelry. An alternative formula was sought, of which a gold, palladium and silver alloy is now commonly used. As palladium and silver are also precious metals, the reduction in price over 24k gold isn’t as great as when nickel is used, but it significantly reduces the chance of dermatitis occurring in the wearer. Even with the addition of the two white metals, the finished alloy still has a slightly warm look. Rhodium plating brightens the alloy. The problem with the plating is that it is, in itself, not particularly durable, and white gold rings and other items will require re-plating after several years, due to the rhodium wearing off. However, despite this minor inconvenience, white gold has brought the “platinum look” to far more people than would otherwise have been possible with simply using platinum. White gold is beautiful with colorless diamonds, and also complements colored stones like rubies, emeralds, and sapphires perfectly. 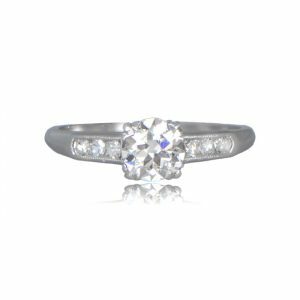 Click here to compare white gold and platinum. Rose gold, originally known as “Russian gold” due to its popularity there in the early 19th century, and now commonly also referred to as pink or red gold, is another alloy, and has been increasing steadily in popularity over the last 20 years, even to the point of being simulated as a finish for smartphones. Rose gold is an alloy of yellow gold, copper, and silver. The copper to silver ratio usually determines how rose/pink/red the final color will be. 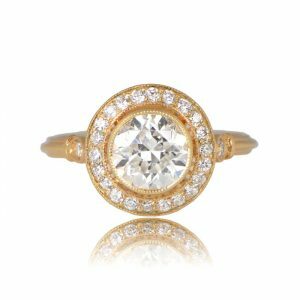 The yellow gold volume is usually fairly consistent at around 75% making rose gold, in effect, 18K gold. It also doesn’t bring any of the plating or skin irritation problems of white gold but has greatly increased durability over yellow gold. Rose gold is common in wedding rings. It is just that bit different and is likely to draw admiring comments. 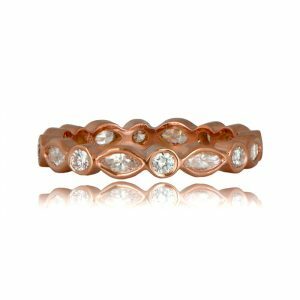 When used to set stones, rose gold is surprisingly versatile but is best when set with colorless diamonds. The contrast between the white of the diamond and the relative boldness of the rose gold makes a breathtaking combination. The color of the metal is usually directed by personality and/or previous jewelry you may own. In most cases, the decision will be final. It is highly recommended to put plenty of thought into the color of your ring before making your purchase.